Today I would like to share a card with you that I made for Sue and Harvey in April of this year. You can purchase the stencil here. Hope you like it. Make a 6"x6" base card from white cardstock. Take a piece of peach card and cover with the stencil, spread sparkle medium over it with a palate knife. Remove stencil and leave image to dry. 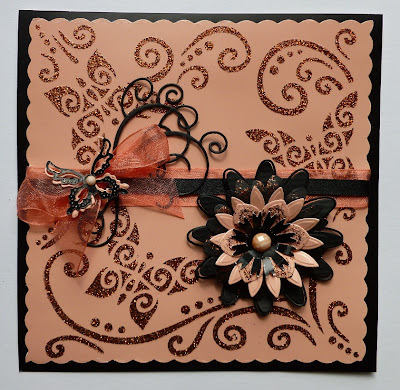 Trim around the edges with a scalloped blade and add ribbon and bow across the centre, then mat onto the black base card. Add the black scroll die - cut to the left hand side of the card and glue in place adding one peach and one black butterfly die cuts, one on top of the other, to the centre of the bow. Punch and die cut the flowers from peach and black card, adding some sparkle medium to one black and one peach flower. Glue a peach coloured gem to the centre of the flower and to the butterfly's body. That's it friends until the next time, take care of yourselves and above all - have fun with your crafting, because that's what it is all about. 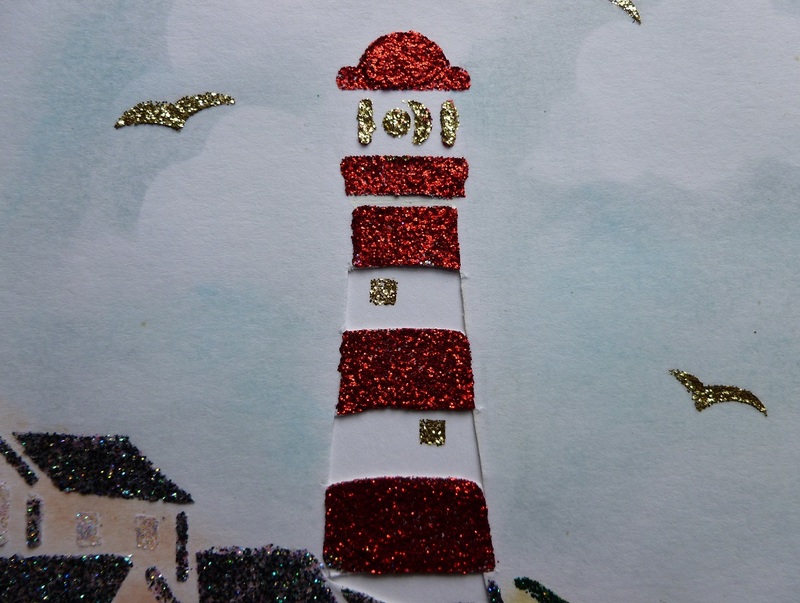 Whilst we still have this lovely weather I thought I would share with you a card I made for Sue and Harvey in March 2012, using their fabulous Lighthouse Stencil and Sparkle Medium which you can purchase here. 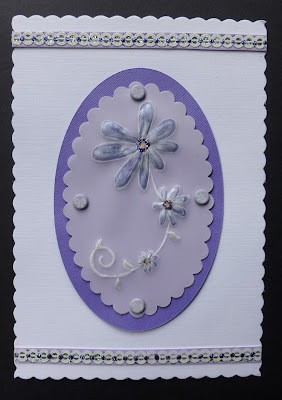 To make this card I made a square card using white cardstock and trimmed the edges with my trimmer and wavy blade. 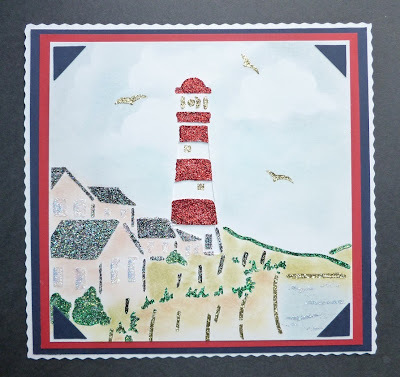 I then matted and layered Navy and Red card stock. I took a white square white card and laid the stencil on to and spread the Sparkle Mediums with my palette knife. I then left this to dry. Once dry I coloured the houses, grass and sea with distress inks. I coloured the sky but left a few white spaces to represent clouds. I cut out the white parts of the lighthouse. On another piece of white card I used Gold Shine and Black Stars Sparkle Medium for the windows, light and the door. I cut this panel out and glued behind the lighthouse, These should show through the cut out parts of the lighthouse. 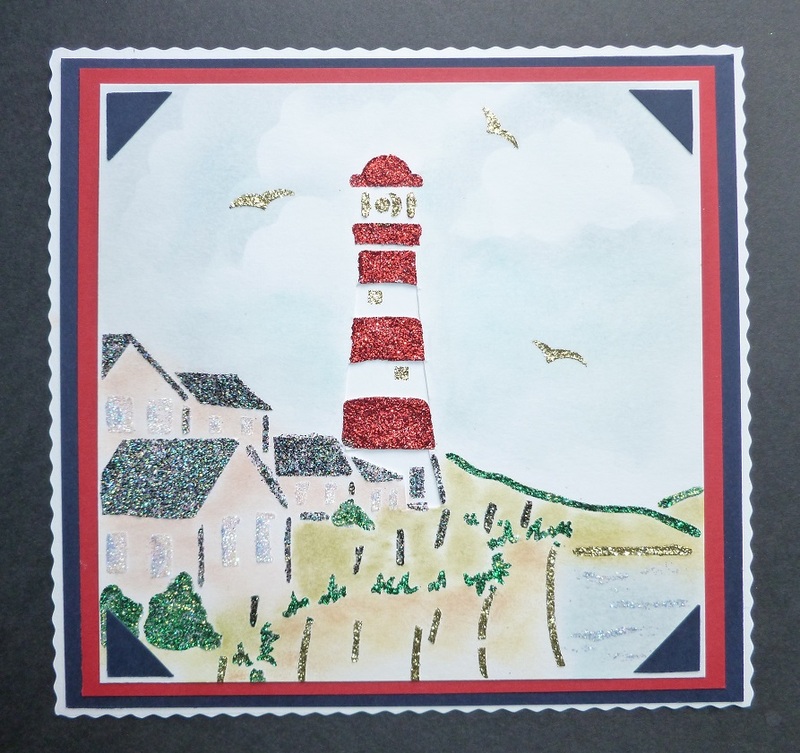 I then matted this onto the red card and added Navy triangles to the four corners. Today I thought I would show you a card I made for Sue and Harvey in September 2010. I stamped the Daisy Stamp onto white paper using black in then took some vellum and put them both on an embossing mat and using an embossing tool, traced around the image. I then removed the vellum from the stamped image, turning the vellum to the wrong side and painted the petals with the violet pearly paint. I then turned it back to the right side and painted the petals with the soft blue paint. The centre of the flower and leaves were painted, I then added some glitter glue around the centres. 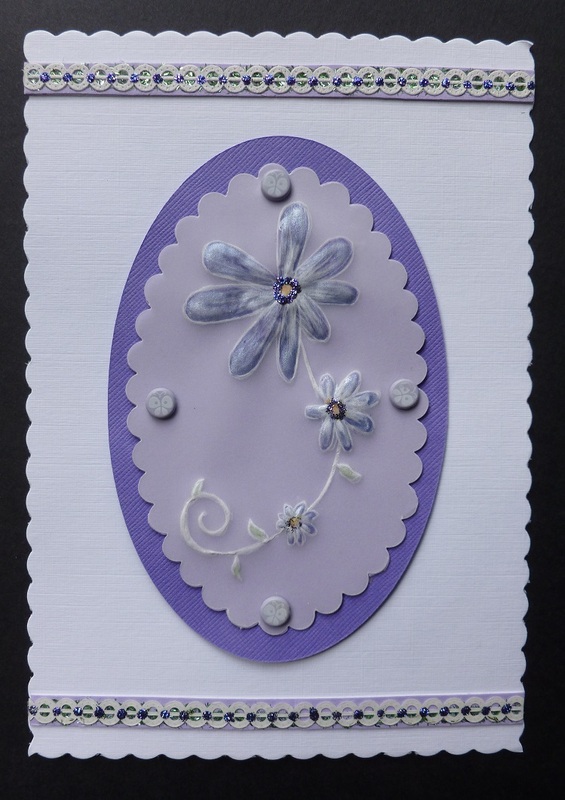 This was then matted onto lilac scalloped oval card with brads, matted onto purple oval card. I added a border to the top and bottom of the card, voila that is the card made.